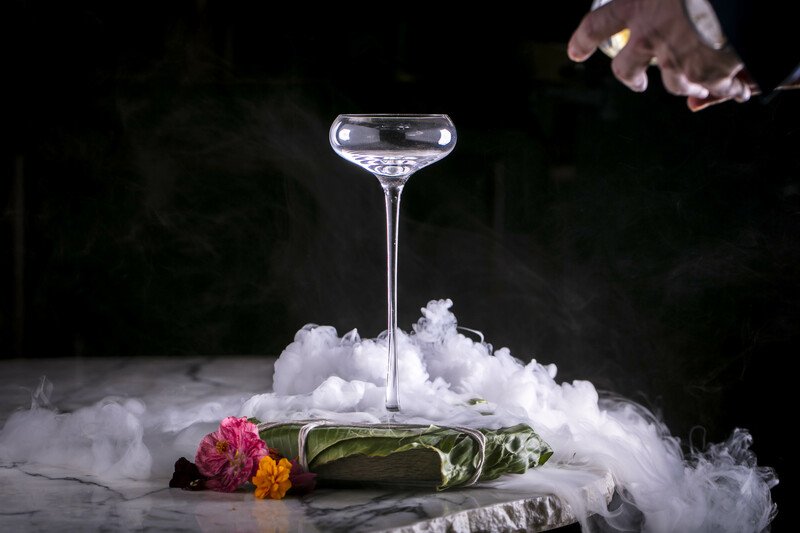 The menu has carefully been crafted by Head Mixologist Ronny Barbazza who has previously worked at other world renowned bars such as Skylon, Novikov and Browns. The menu is split into two sections, a description of each can be found below. Half the menu is influenced by and celebrates five mystical animals in Asian Tradition that represent cardinal points. These consist of: the Black Turtle representing the NORTH, the Vermillion Bird representing the SOUTH, the Blue Dragon representing the EAST, the White Tiger representing the WEST and lastly, the Yellow Dragon representing the CENTRE. If you cannot decide which point to try like me, then why not sample each cocktail to connect the points? It makes sense right?! Japanese whiskey Yamazaki, umesha and Asian gin are the main ingredients infused in these cocktails, and are accompanied by other exotic elements such as sake, matcha (my personal favourite), yuzu juice and Lu Lu Tong. 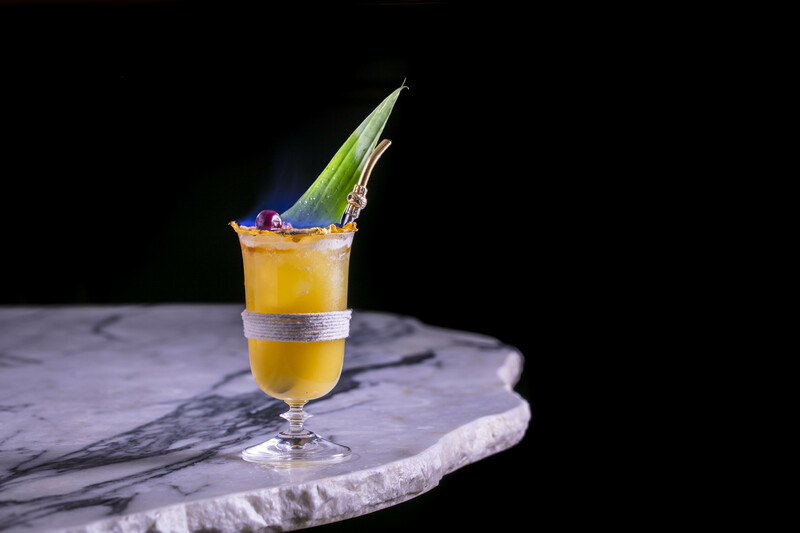 It is fair to say that each cocktail comes with its own personality and distinctive Asian flavour. 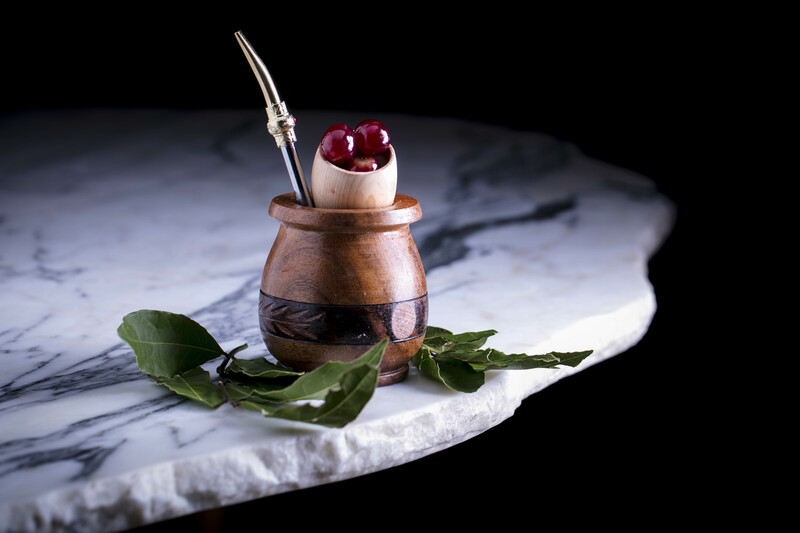 The other half of the menu, influenced by Latin America, is designed around and celebrates the classical elements of fire, air, land, water and aether, all of which feature heavily in the mythologies of the indigenous Inca, Maya and Aztec civilisations. A Latin American twists is put on each cocktail using the following ingredients: mezcal, pisco and dark rum, lime, jalapenos, pineapple juice and fresh avocado. Inspired by the Aztec sun god Tonatiuh who provided warmth and fertility to the people. Mezcal, dark rum, lime juice, jalapeño syrup and pineapple juice, garnished with dry pineapple and set on fire. In celebration of Quetzalcoatl, the most famous Aztec deity and known in many other Mesoamerican cultures such as Teotihuacan and the Maya, who was the god of wind and learning. Pisco, Falernum, lime juice and peppermint syrup, served with smoke. The Land Dedicated to Centeōtl who represented land and agriculture, particularly maize, which was traditionally cultivated by the indigenous civilisations. Johnny Walker Black Label, dry sherry, verjus, half a crushed avocado and Peychaud’s bitters. The Water In homage to Chalchiuhtlicue, the Aztec goddess of water, rivers, seas and streams. A mix of Copperhead Gin, Trois Rivières rum infused with oyster leaves, verjus and simple syrup, topped with Mediterranean tonic. Influenced by Citlalicue, the goddess who created the stars, the Milky Way, Earth, and also death and darkness. Tequila, Fernet Branca, lime juice and Angostura bitters. The zoomorphic incarnation of the Yellow Deity of the centre of the universe in Chinese religion and mythology. 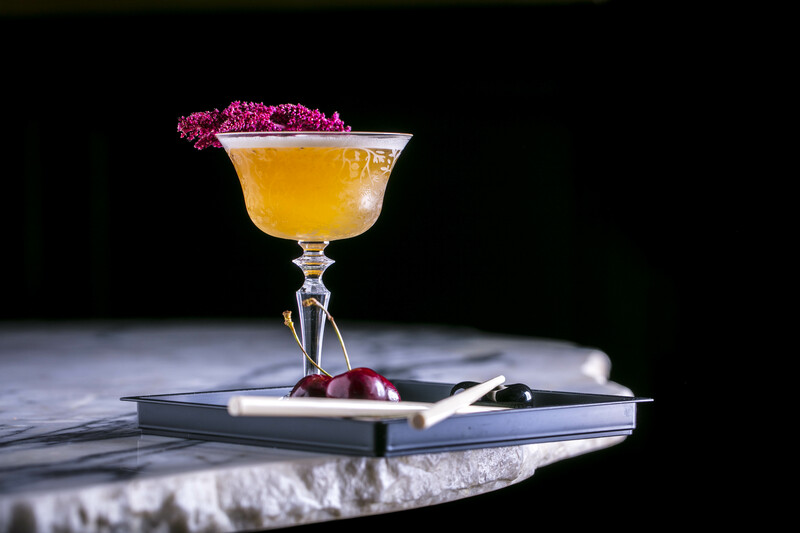 Featuring Yamazaki 12 year old, umeshu liqueur, Lu Lu Tong syrup and lemon juice topped up with Asahi beer foam and garnished with an amaranth flower. One of the Four Symbols of the Chinese constellations, representing the East and the spring season. Asian gin, Italicus, cranberry bitters and yuzu juice, decorated with blue candy floss. Elegant and noble in both appearance and behavior, representing the South and summer season. 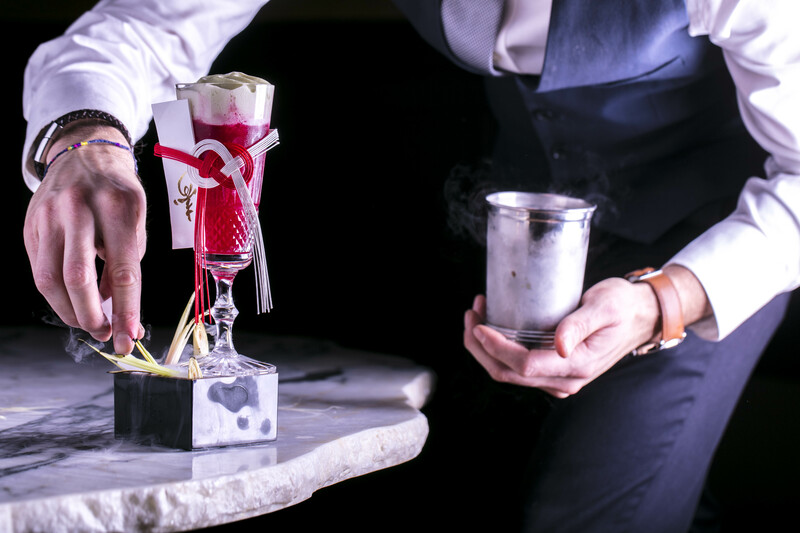 Vodka, beetroot and raspberry homemade shrub, gomme syrup, champagne and matcha foam, served with dry ice. The king of the beasts who supposedly only appeared when the Emperor ruled with absolute virtue, or if there was peace throughout the world. Vodka, sake, Oriental syrup, lemon juice and Bergamot bitters. Usually depicted as a turtle entwined together with a snake, it represents the North and the winter season and is said to be one of the four guardian spirits protecting the city of Kyoto in Japan. Cognac, sake infused with cinnamon, apple juice, lemon juice and seaweed syrup.